Mizoram University Recruitment 2019 April -Professor,Assistant Professor and Associate professor Posts [139 nos]:- Welcome to North East India's No. 1 Job Portal NeCareer.com . Mizoram University has issued a huge recruitment notification in April 2019. 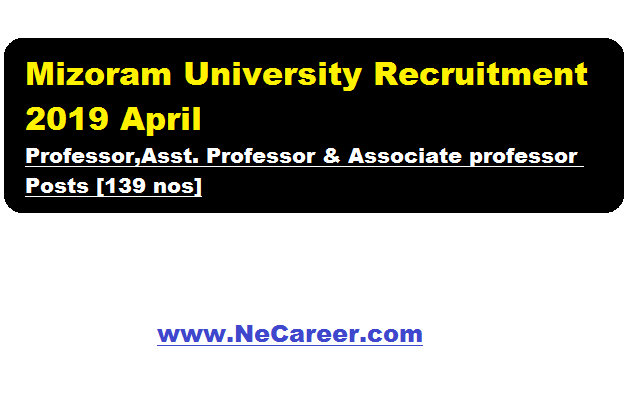 According to the recruitment, applications are invited for professor Job Vacancy at Mizoram University . MZU invites candidates who completed Any Post Graduate, M.Phil/Ph.D for 139 posts of Assistant Professor, Associate Professor, Professor. Find more details in below section. e) The candidate has presented at least two papers based on his/her Ph.D work in conferences/seminars sponsored/funded/supported by the UGC/ ICSSR/ CSIR or any similar agency. The fulfillment of these conditions is to be certified by the Registrar or the Dean (Academic Affairs) of the University concerned.Professor Job Vacancy: Mizoram University Recruitment-139 Posts . (iii) NET/SLET/SET shall also not be required for such Masters Programmes in disciplines for which NET/SLET/SET is not conducted by the UGC, CSIR or similar test accredited by the UGC, like SLET/SET. OR B. (i) An eminent scholar having a Ph.D degree in the concerned/allied/relevant discipline, and published work of high quality, actively engaged in research with evidence of published work with a minimum of 10 research publications in the peer-reviewed or UGC-listed journals.Professor Job Vacancy: Mizoram University Recruitment-139 Posts . (iii) A total research score of 120 as per the criteria given in Appendix II, Table 2. OR B. An outstanding professional, having a Ph.D degree in the concerned/allied/relevant disciplines, from any academic institutions (not included in A above)/industry, who has made significant contribution to the knowledge in the concerned/allied/relevant discipline, supported by documentary evidence provided he/she has ten years’ experience. Mizoram University Recruitment 2019 April. The prescribed format of application and other required materials may be downloaded from Mizoram University (MZU) website, www.mzu.edu.in in A-4 size paper. Applications should be supported by relevant documents (self certified) in all respects. Claims of educational qualifications should be supported by Certificates/Marksheets. Applications not supported by documents shall be summarily rejected. Last date of receipt of complete application is 30th April, 2019. Separate application is required for different posts and different reserved categories (i.e, for post bearing different codes). 1. Due care has to be taken while compiling the application and subsequent submission. The application should be properly compiled, stapled, spiral bind etc. in a way so that no page of the application falls apart while handling the application. The task of stitching together the application and its enclosures should not be left to the University. 2. Do not staple the passport photo. It should not be attached separately. Paste it on the application with good quality glue. 3. It is advisable to properly linked claims of applicants in the ‘application form’ and ‘other required proforma’ with the ‘supporting documents’ and other ‘enclosures’. This is especially important for applicants at the level of Associate Professor and Professor where more number of supporting documents are submitted by the applicants. This may be done by giving Page No. in each supporting document and the Page No. mentioned in the format filled up by the applicants. 4. Date of Birth should include the ‘Year’ of birth. Date of birth as in 1 st March, without year should be avoided. 5. Percentage of Marks should be clearly indicated in SN 17 of the application form. 6. Duration of experience should be indicated in ‘dd/mm/yy’ or ‘dd/mm/yyyy’ format to reflect the complete picture. Duration of experience as in 1990 – 1995 does not reflect the exact duration since ‘months/days’ are also taken into account. 7. The application contains a declaration that you will abide by the terms and conditions of the advertisement etc. Therefore, ‘Date’, ‘Place’, and ‘Signature’ should be put in the designated place. 8. Last date of receipt is the date on which your application should have been received by Mizoram University. Due to the geographical location of the University, applicants, especially from outside North-Eastern States, are advised to send their application at the earliest possible. 9. Submission of application through E-mail is not entertained. 10.Applicants intending to avail the service of private courier are advised to take precaution before sending their application and verify that Mizoram University (PIN-796004) is within the service area of the concerned courier.